This beauty comes from long time collector Jim Kubus. 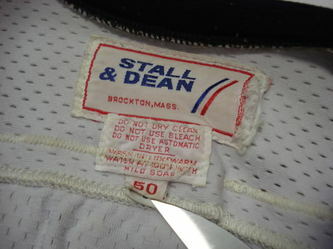 The jersey came with the nameplate furnished loose as it was removed by the team with the intent to recycle the jersey. I had veteran Penguins expert Casey Samuelson reattach the plate as it was originally. I think the jersey displays much more impressively this way. Whites from this set seem to be much rarer than the blues for whatever reason. 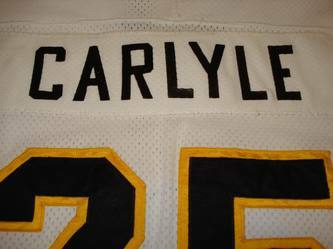 Screened name on sewn on nameplate, sewn on numbering. Fight strap. 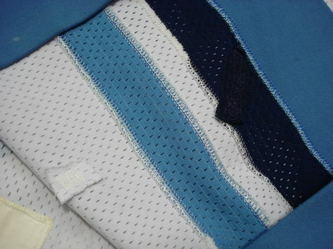 Jersey shows lighter wear and retains its original crest. This Stall & Dean jersey was originally made for the 1977-78 season as is indicated by the 7 flag tag in the collar. Sized 50 this jersey was just right to be recycled to someone of Kindrachuk's stature. An obvious one digit number change was all that was needed to make this jersey worthy for the new team captain. 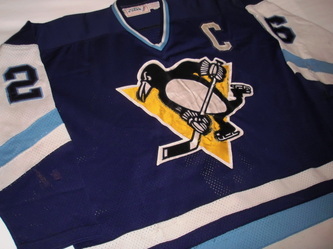 The captain's C is also white trimmed in dark blue which seems odd on a dark blue background, but it's likely recycled from another jersey as well, and may not have originally been intended for a dark road jersey like this. The Pens frugality in the early days is well known throughout the hobby. 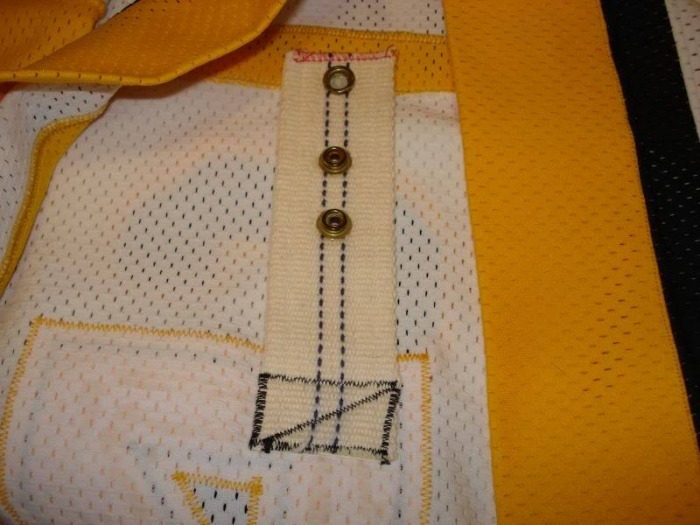 It made for some of the most interestingly repaired and modified jerseys. 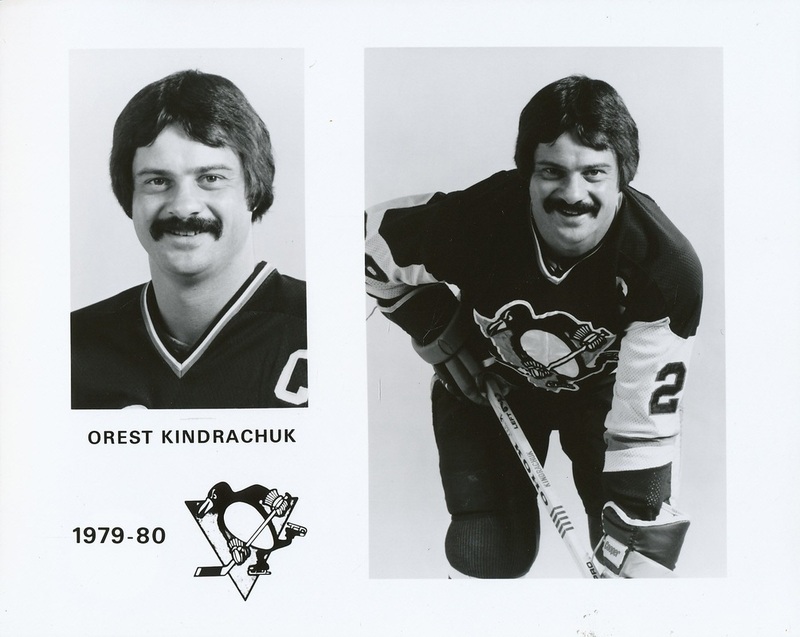 This Kindrachuk is no exception. 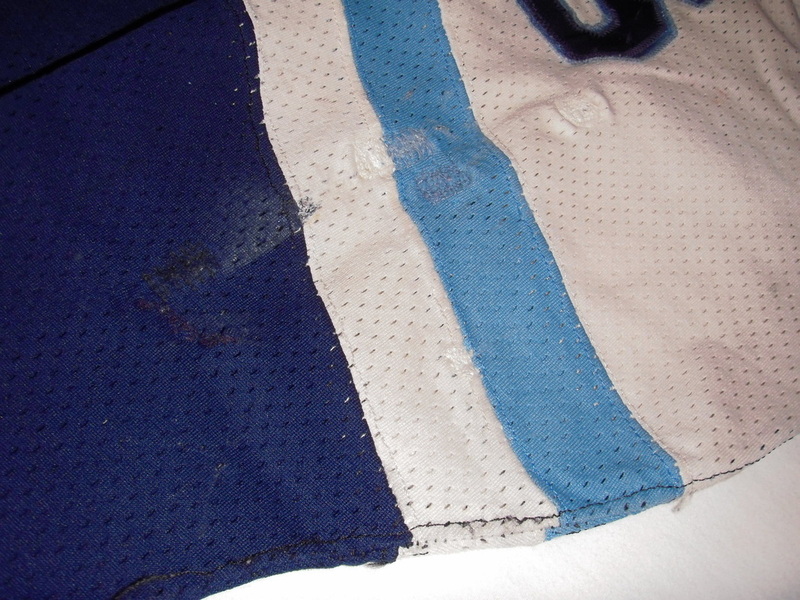 The numbering and crest are very dilapidated from repeated washings. Heavy repairs throughout. Blood stains and board burns as well. This one has it all...a 10+ for eyeball. 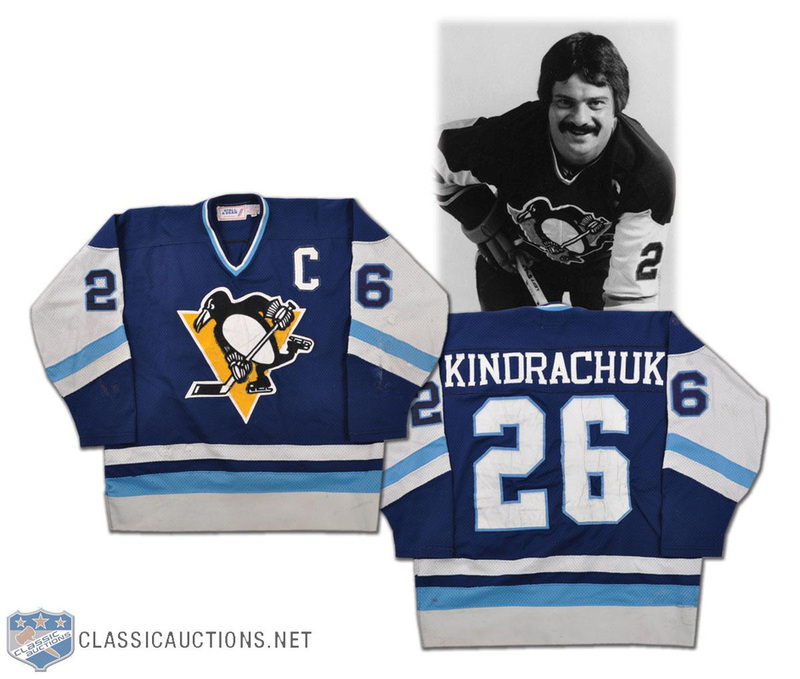 The original serif Kindrachuk nameplate remains intact as it was added by the team back in circa '78. 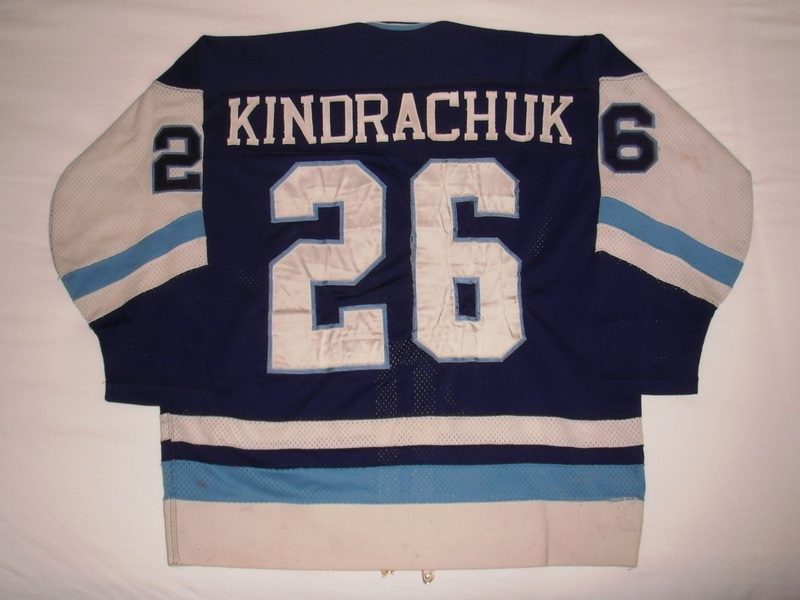 I suspect this is one of the only road blue Kindrachuk's with the C that is known in the hobby. 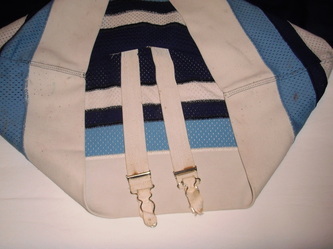 Heavy repairs abound on this one particularly on the sleeves and front hem area. 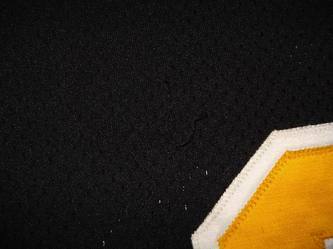 The intracately sewn and heavily repaired crest is one of the best looking I've seen on a gamer of this era. Several of the jersey's sleeve and body repairs are fabric backed, and all are appropriately faded with age. The original numbers are heavily puckered from repeated wear and washings. 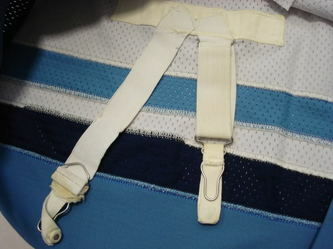 Garter type fight strap has Braille inventory sticker still attached as it comes from the former collection of Kevin Fiernbach who unfortunately lost his sight and would keep track of his jerseys with the unique Braille tagging he'd add to the fight straps. While not original to the jersey I feel it is important to keep the tag intact, as it is part of the jersey's history which at this point has taken on a significance of it's own. We are all only keepers of these artifacts while we are able, well bodied, and blessed to do so. Each time I look at or hold one of these amazing jerseys I can appreciate what some others aren't fortunate enough to do anymore. I hope to someday pass my collection down to my son Levi should I become unable to care for or appreciate it. I hope that by the time that day comes he too will appreciate and protect the history contained within these pieces of old fabric. 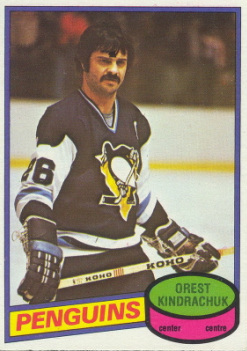 A solid playmaking center who could play defense and kill penalties, Orest Kindrachuk played over 500 games for three different NHL teams. He topped the 30-assist mark five times in his career and was dangerous on the powerplay and while shorthanded. 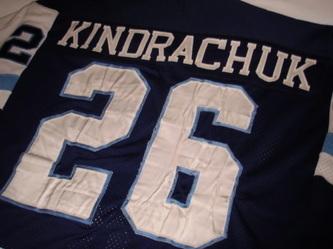 Kindrachuk spent four years with WHL's Saskatoon Blades. Midway through his junior tenure he stepped away from hockey to attend the University of Saskatchewan. 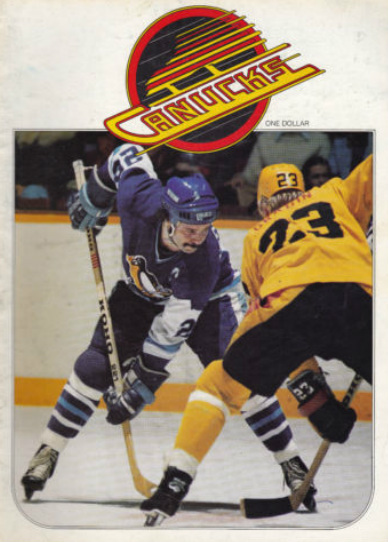 When he decided to resume his hockey career, Kindrachuk was able to return to the WHL as an overage player. He led league with 100 assists in 1970-71 then signed as a free agent with the Philadelphia Flyers. He spent almost all of his first two pro seasons in the minors, first with San Diego Gulls of WHL then the Richmond Robins of AHL. 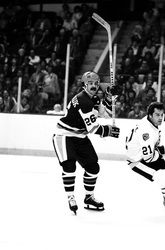 As a rookie in 1973-74 he scored 41 points as the third center behind Bobby Clarke and Rick MacLeish. The youngster was solid in the playoffs and helped the Flyers become the first expansion team to win the Stanley Cup. In 1974-75 he missed 20 games due to an injury but was a solid checker in playoffs as Philly repeated as Stanley Cup champions. 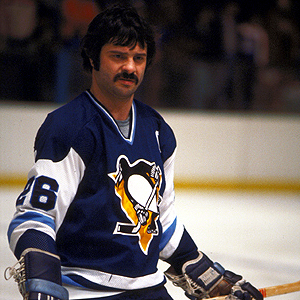 By 1975-76, Kindrachuk assumed a more prominent role. In addition to checking and killing penalties, he provided offence and was used as a playmaker on the power play. He set career highs of 26 goals and 75 points then returned to more of a checking role in next two years. During this period he occupied one of the safest places in hockey as the pivot for tough wingers Don Saleski and Dave Schultz. 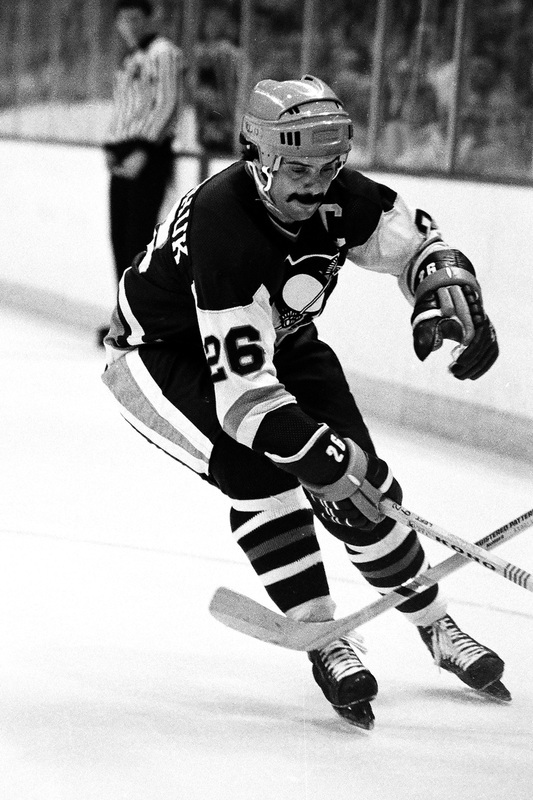 At the Amateur Draft in June 1978, Kindrachuk was traded to Pittsburgh with Ross Lonsberry and Tom Bladon for the first-round draft pick used to claim highly touted defenseman Behn Wilson. 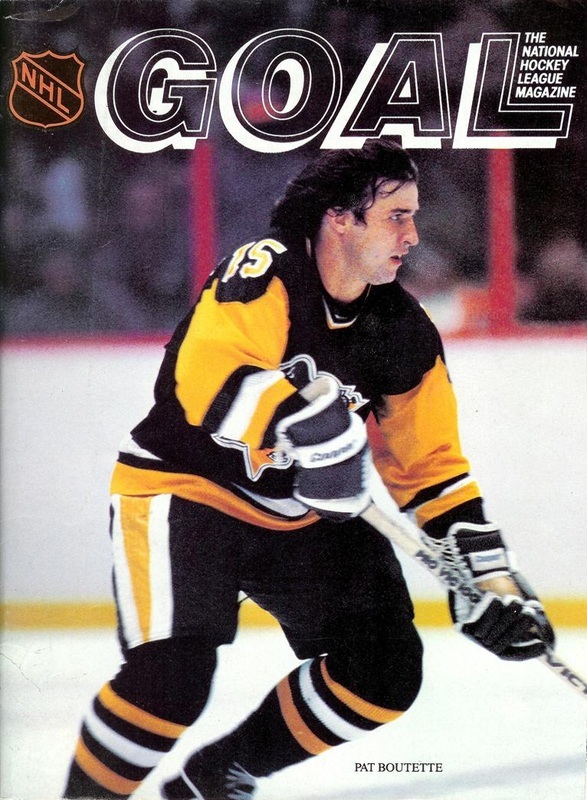 Kindrachuk scored 60 and 46 points the first two years with weaker Pens playing on a line with Lonsberry and Rick Kehoe. 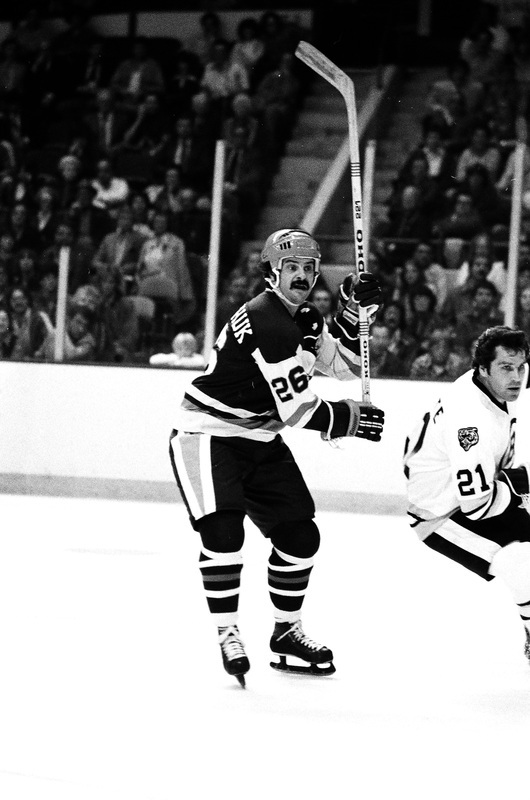 He played only 13 games in 1980-81 then signed as a free agent with the Washington Capitals the following September. He was forced to retire four games into the 1981-82 schedule. This fully sewn jersey is a delight to look at, particularly with all of the intricate hand cutting and stitch work on the all twill crest. 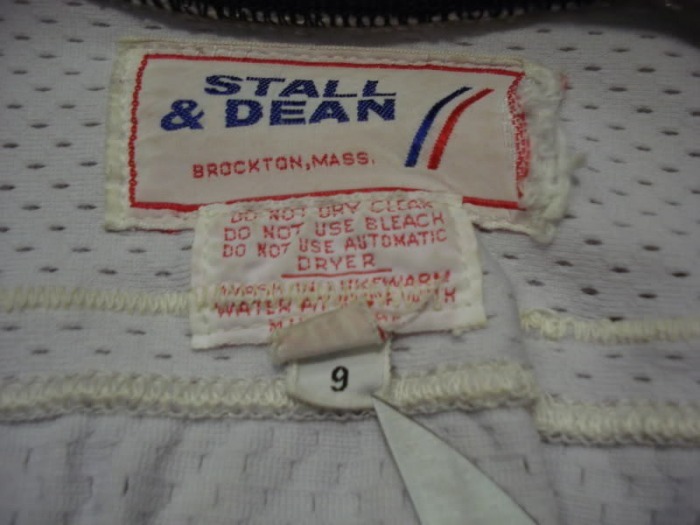 Worn by defenseman Tom Bladon for the 78-79 season, it shows great wear and was an apparent 79-80 preseason carryover as it's had the nameplate removed and never reattached. Some great wear and repairs on this one, and significant wash fading to the numbers. These jerseys are becoming very difficult to source, as white versions of this particular style jersey have never been in great abundance and collectors have become very reluctant to move any pre-1980 blue Penguins these days. 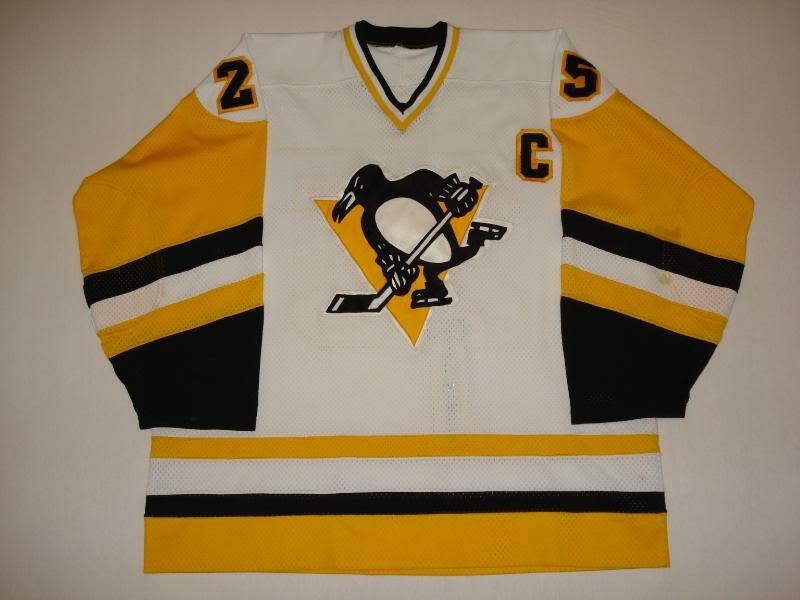 Unfortunately it's missing the original nameplate, but is still 100% original and as last worn off of the ice. Thanks go out to Mitch Amaya and his Gameworn Jersey Collectors FaceBook group for putting me in touch with this one. This jersey was worn in the famous fight vs Dave Semenko in front of a capacity crowd at the Igloo on Friday, January 18th, 1980. It was just 2 days prior to the Steelers winning their 4th Super Bowl in Pasadena, so it was 1/2 of a very memorable weekend in Pittsburgh sports history. 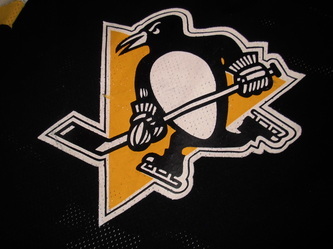 This was Wayne Gretzky's first visit to Pittsburgh and the Penguins set a Civic Arena record for most penalty minutes in a game recording a total of 144. The Edmonton Oilers' 123 minutes was also a record. 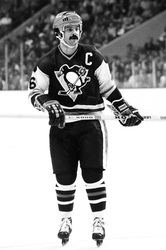 Pens defenseman Russ Anderson set a team record with 51 penalty minutes. Kim Clackson recorded 3 separate fighting majors during the game and while wearing this jersey. No surprise it shows some great signs of abuse. 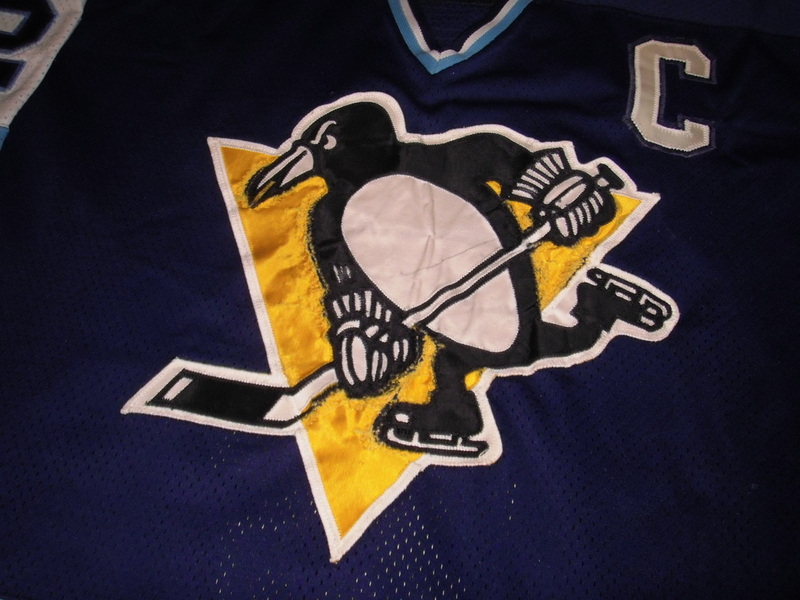 In a stroke of strange luck...I acquired this jersey from a private collector in a parking lot cash deal, only to rush back to a TV to watch game 6 of the '09 Pens/Flyers series when Talbot SHH'd the crowd and the Pens went on to win the game and series on the road. Sometimes a year's worth of luck hits you all in one day. The jersey shows nice fight wear and has several sewn repairs that are reinforced with fabric backing. 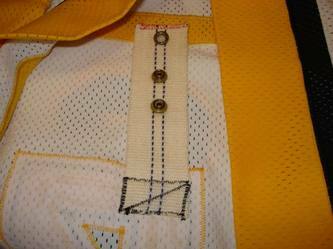 Popped elastic in the cuff as well as popped stitches in the collar tagging are a testament to the abuse this jersey saw. 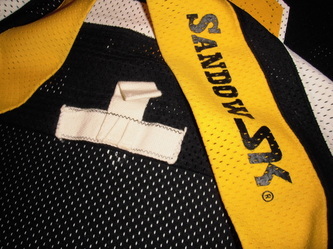 Also has a nicely stretched out fight strap and the unique off center nameplate which can be easily videomatched to rare fan footage that has recently surfaced from the game. This game was unfortunately not televised locally or nationally and no known tape of the game exists. Enjoy the brief clip linked below...it's all that's left of that historic night in the Igloo. Pay particular attention at the :08 second mark...it was Kim's supposed high stick that brought down Gretzky and naturally Semenko came after him looking for blood. Clackson drops the gloves and melee ensues...eventually leading to Oilers coach Glen Sather attempting to climb the glass only to have it fall in on him. Enjoy...Old Time Hockey! 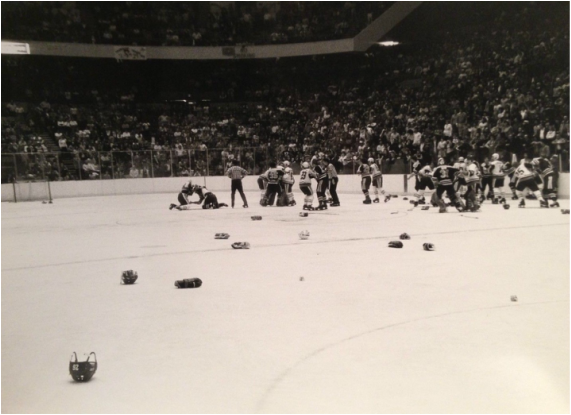 This vintage press photo depicts the action from ice level. Looks like even the goaltenders were going at it. Defenseman Kim Clackson played three years of junior hockey before making the leap to professional hockey. Clackson, who was born in Saskatoon, Saskatchewan on February 13th, 1955, was drafted by the Pittsburgh Penguins in 1975 as well as the World Hockey Association's Minnesota Fighting Saints that same year. 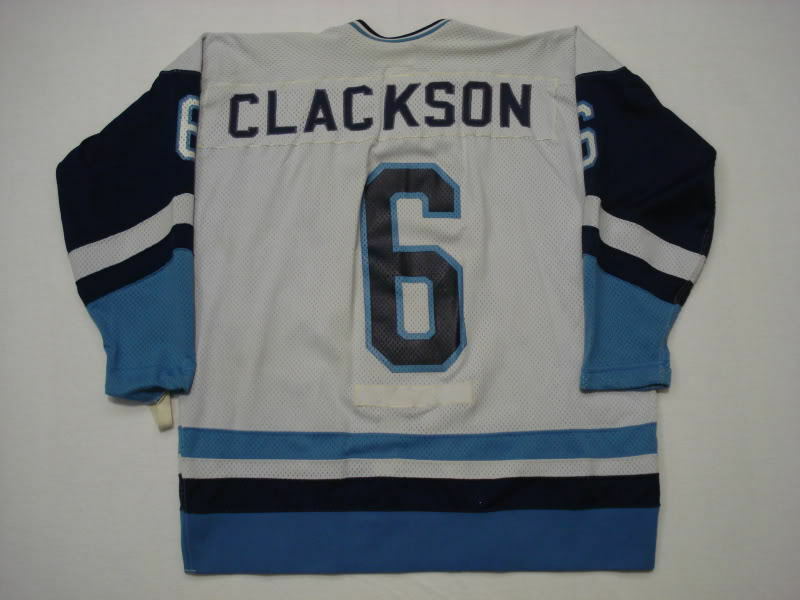 Clackson felt he had a better opportunity in the WHA and began his career there in 1975-76. The Minnesota franchise soon folded and Clackson signed with the Indianapolis Racers as a free agent. After his second year with the Racers, Clackson signed with the Winnipeg Jets for two more years. 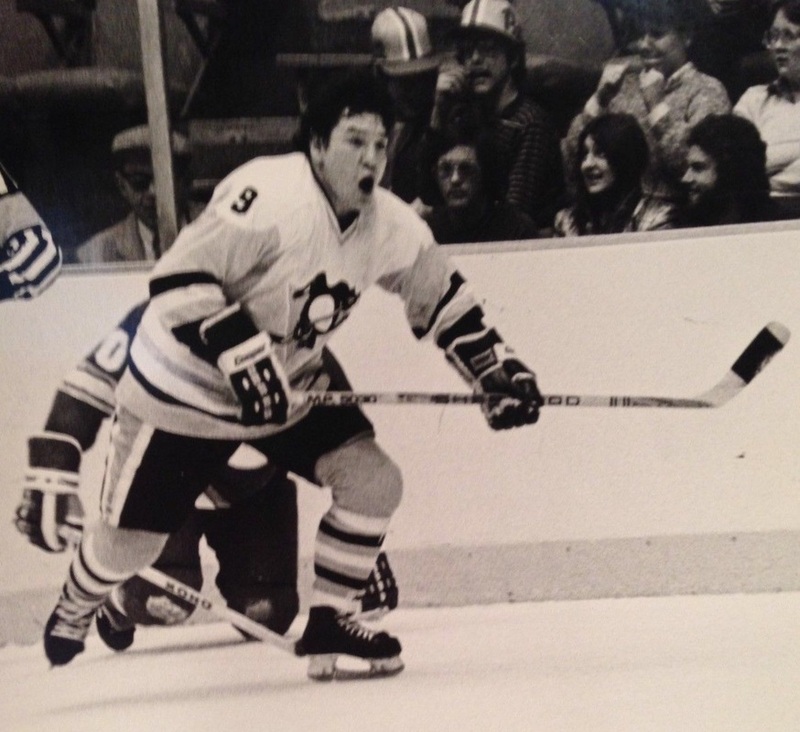 When the WHA and NHL merged in 1979, the Penguins re-claimed Clackson and he was set to make his NHL debut. 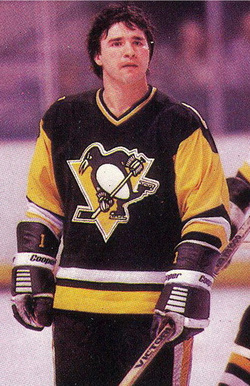 Clackson spent the 1979-80 in the NHL with Pittsburgh. He played 45 games and registered three assists. The following year his rights were transferred to the Quebec Nordiques as compensation for the Penguins signing of free agent Paul Baxter. Clackson suited up for 61 games with the Nordiques, bettering his point total from the year before by two. 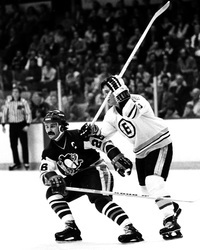 The 1980-81 season would be Clackson's last as a professional hockey player. He retired with a rather dubious honor, having played in a total of 106 total NHL games without scoring a single goal, more than any other NHL player at the time, a true testament to the value of the physical presence he brought with him. 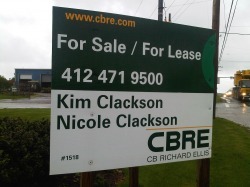 Interestingly enough, following his professional hockey career, Kim Clackson has gone on to pursue a successful career as a commercial real estate agent working locally for CB Richard Ellis for number of years now. Kim is actually their Senior Vice President, so if you're in need of a good commercial property, or someone's face pounded in, Kim is the man to call. Click here to read more about Clackson including words from Dave Semenko himself. Please note...I believe Semenko is incorrect in his recollection of venue. I think he is referencing the 1-18-80 game @ Pittsburgh, as his description of events match this game exactly. This great looking jersey comes from long time collector Duane Schafer, from all the way out in San Diego, CA. I'd been eyeing this jersey for some time, and a man of his word, Duane reached out after having acquired another Kehoe for his collection, so a trade + cash scenario was exercised immediately to bring this beauty home. A great example of the 80s mesh style, and while I have 3 Kehoe gamers in the collection, this is the only #17. The original nameplate is still intact. It doesn't get any better in terms of originality. 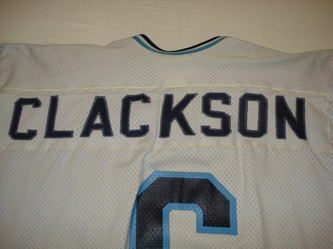 The nameplate being offset is consistent with others from this set including my own Clackson. Rick is a true gentleman of the sport and a great Penguin ambassador. I'm proud to have met him personally and purchased items from him first hand. A very rare example from the first set of 79-80, this road blue jersey features a screened on/sewn on crest. 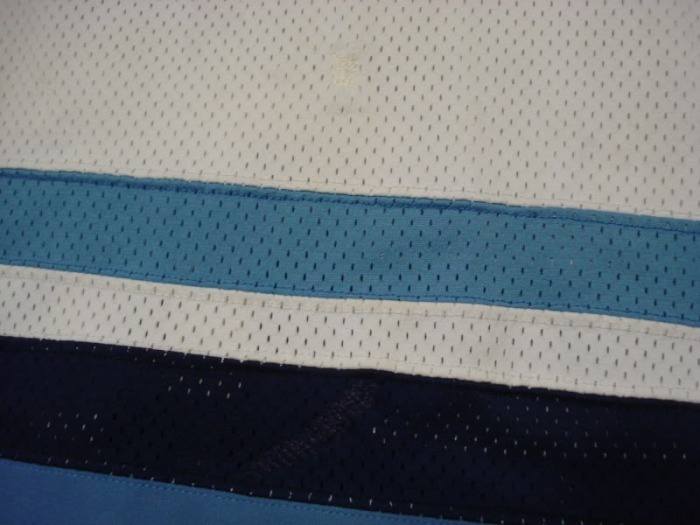 The white versions of these jersey have the crest silkscreened directly onto the jersey material, but with the dark color of the blue jerseys, these had to be screened onto a separate piece of mesh and then sewn to the jersey. I picked this one up in a ClassicAuctions.net auction and have yet to do much research on it. 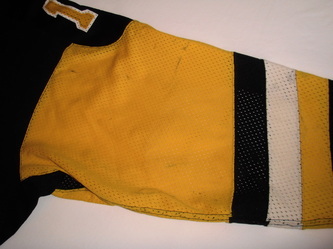 Very light, but evident game wear. The fully sewn nameplate shows the somewhat crude hand cut lettering that we've come to appreciate on these late 70's Penguins gamers. This comes from the very final set of Penguins blues, and aside from a Kehoe is the only road blue 79-80 Penguins gamer I know of in the hobby. 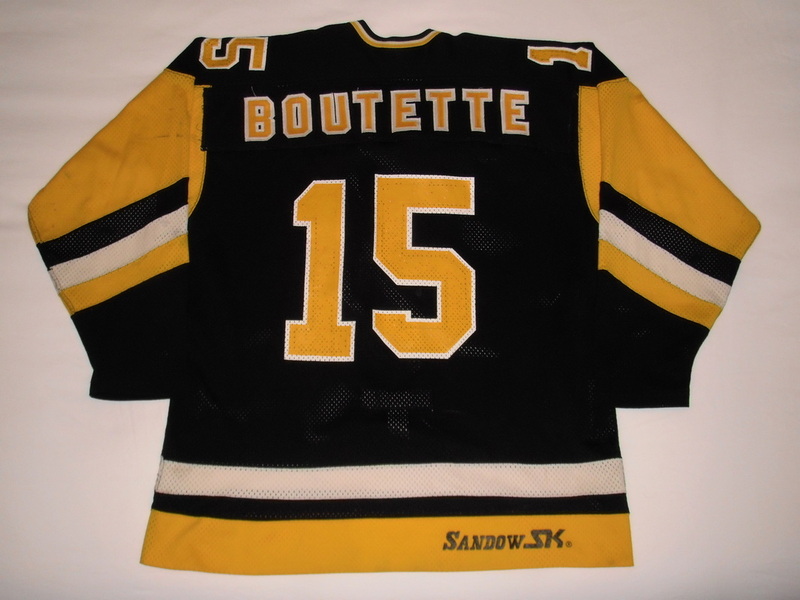 This is, as least as best as I can determine, a 1981-82 set 1 road jersey as worn by Penguin forward Pat Boutette. 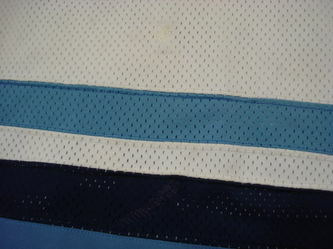 This jersey has the sewn on nameplate on the rear which is very neatly cut and attached. There were at least 2 sets of Sandow mesh jerseys with sewn on names, but one is obviously more haphazardly hand cut and imperfect. 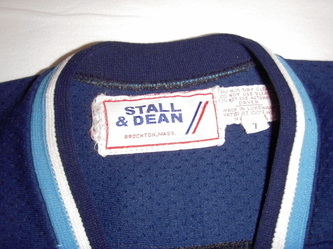 This jersey is from the cleaner and more professional looking set, which I believe to date to the 1st half of the 1981-82 season. The jersey features a screened on Penguin crest as well as the back and shoulder numbers. 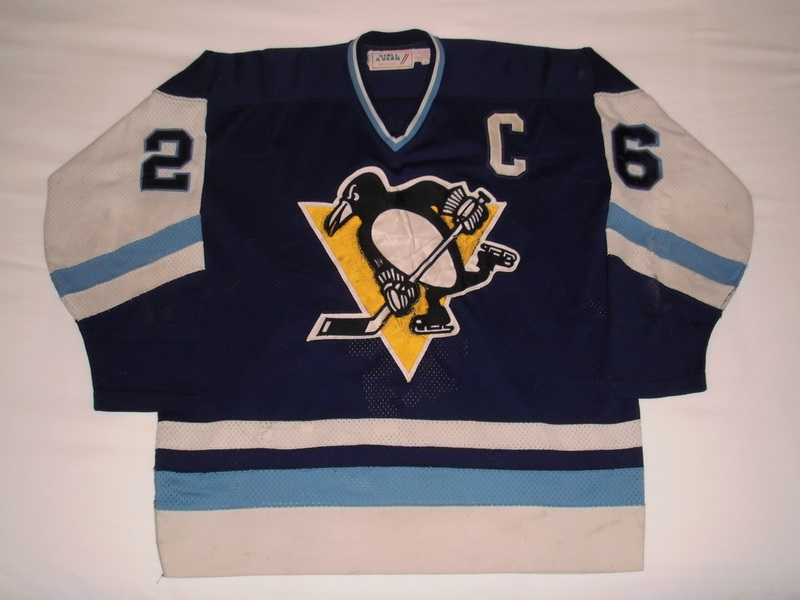 Fortunately, the numbering and crest screen work on this jersey remains very rubbery and flexible despite it's being close to 30 years old, leaving a well preserved example from this great Pens player. As you can see the BOUTETTE name is very neatly trimmed and applied despite the nameplate being a bit too long as it slightly overhangs the sleeve seam on the left side. I'm hoping this unique attribute may lead to a photomatch down the road, as it is a good individual identifier of this particular jersey. 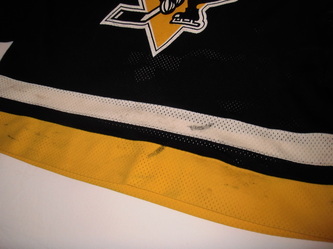 While the jersey doesn't seem to show any team repairs, it does show excellent wear in the form of stick marks and board burns which are prevalent particularly on the jersey's belly. 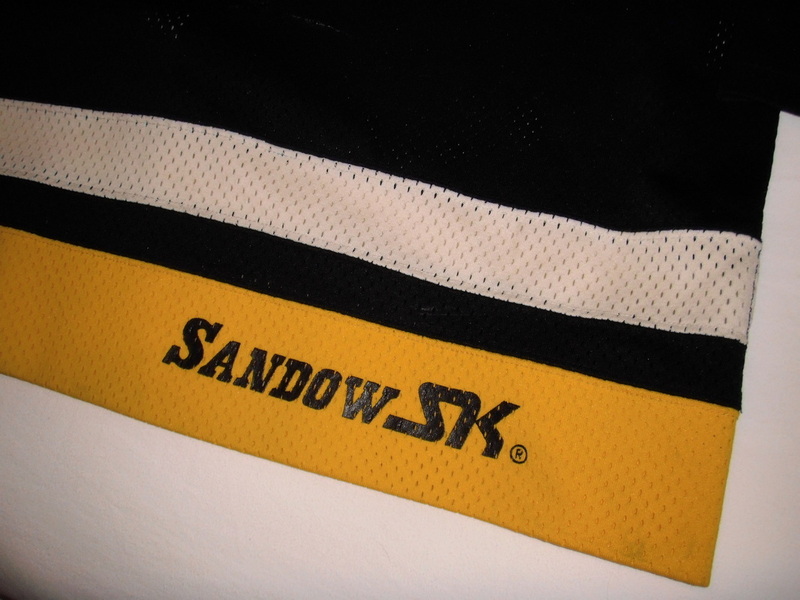 These Sandow jerseys held up remarkably well and are some of the higher quality screened on jerseys you will find in the hobby. All original in every regard, and quite a rarity as many of these jerseys and their nameplates were separated by the team and unfortunately won't likely ever be reunited. Thanks go out to local collector Paul Zella for letting go of this one and allowing me to add it to my collection. 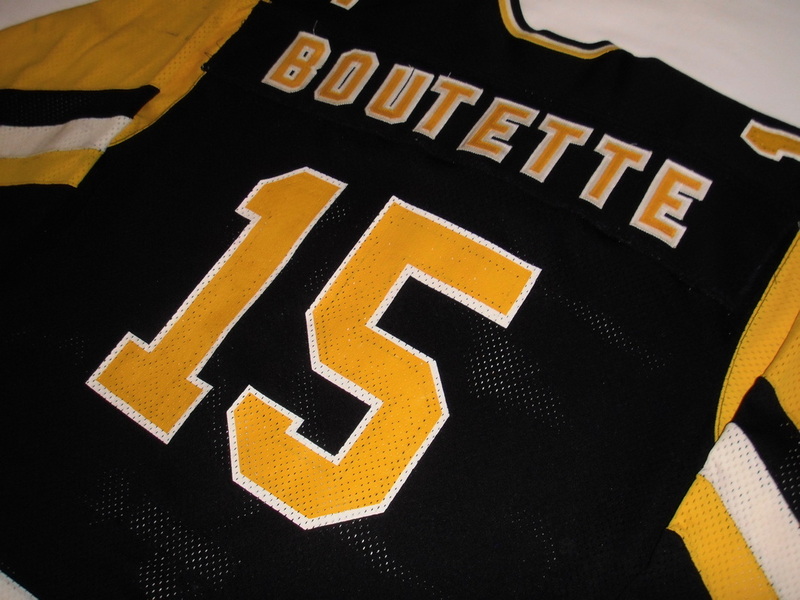 Pat Boutette's career in hockey was consistently marked by a great mental strength that allowed him to face down the odds that tended to jump onto his path from time to time. While skating for the London Knights of the OHA in 1969-70, he was offered a scholarship to attend the University of Minnesota. He accepted the offer in the midst of the usual warnings that such a path would never lead him to the NHL. But with his usual self-assurance, he went south to school He put in three successful seasons on campus, becoming an All-American all-star in 1973. He elected to leave his studies one year shy of his degree in physical education to turn pro with the Maple Leafs' chain. He put in two years of apprenticeship with the Oklahoma City Blazers of the CHL where he honed the style of play that would earn him a long-term ticket in the NHL. Standing only 5' 8" high, Boutette knew that he'd have to become a durable mucker who would never back down from anyone, no matter how much bigger his rivals stood. In 1975-76, he finally got the call to join the Leafs on a line with Dave "Tiger" Williams and Jack Valiquette. Short-guy jokes abounded in the dressing room as Boutette grew in his resolve to work hard and play aggressively against foes of all sizes. It was not uncommon to see him drop the gloves against such leviathans as the Isles' Clark Gillies or the Flyers' Don Saleski. He also managed to find the opposition's net with respectable third-line frequency. Into his fifth season with the Leafs, Boutette was traded to the Hartford Whalers where, despite his short stay, he scored a personal-best 80 points in 80 games for the struggling Whalers. 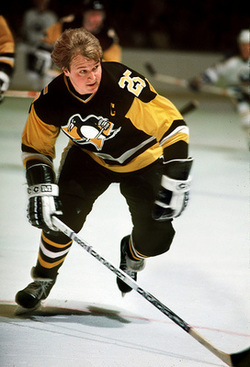 In 1981, he was dispatched to the Pittsburgh Penguins, where he continued to play his aggressive game in the company of Paul Gardner and Rick Kehoe. 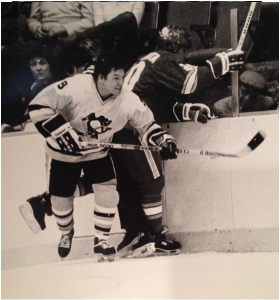 The only difference between life as a Pen and as a Leaf was that, in Pittsburgh, he tended to score more while making life difficult for opponents along the boards. By 1984-85, however, the rugged winger finally began to slow down. His numbers fell off as he was traded back to the Whalers where he played briefly before retiring from the Binghamton Whalers of the AHL at the close of the season. This jersey is the rare and coveted "all sewn" style made by the General Athletic Company of Greenville, Ohio. 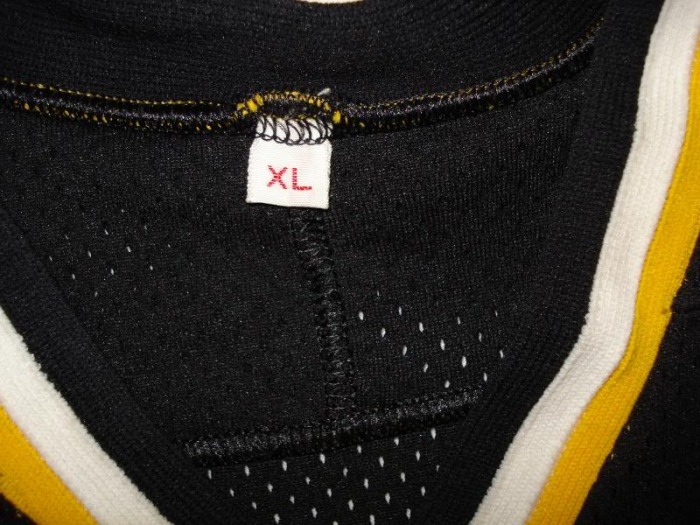 These jerseys bear no manufacturer tagging and carry only an XL or XXL size designation in the collar. Made of heavyweight mesh fabric, they feature a hand cut, hand sewn, all twill skating Penguin logo crest. 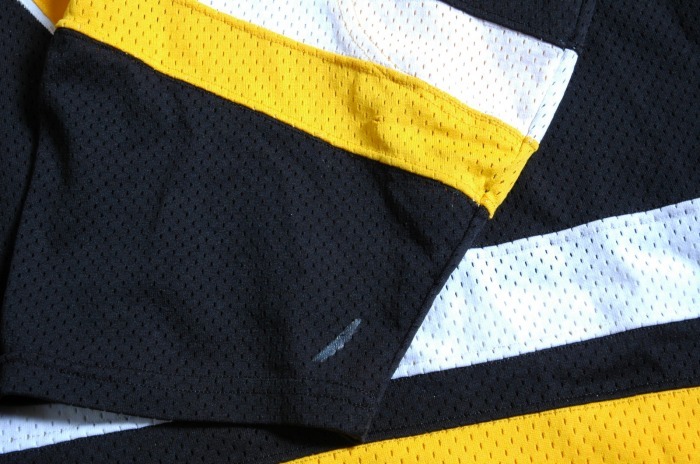 A close look at these jerseys and you can tell they simply "don't make 'em like they used to." 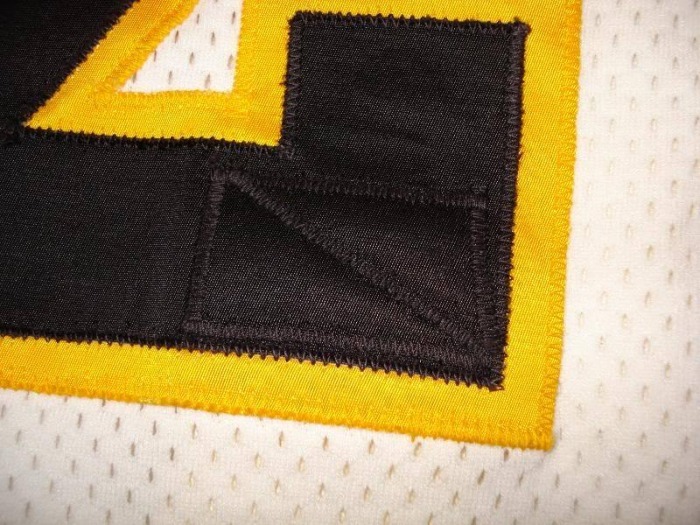 These jerseys feature all sewn, two layer twill numbering, but have screened on names on matching mesh nameplates. This Carlyle is very rare in that it's nameplate remains intact. 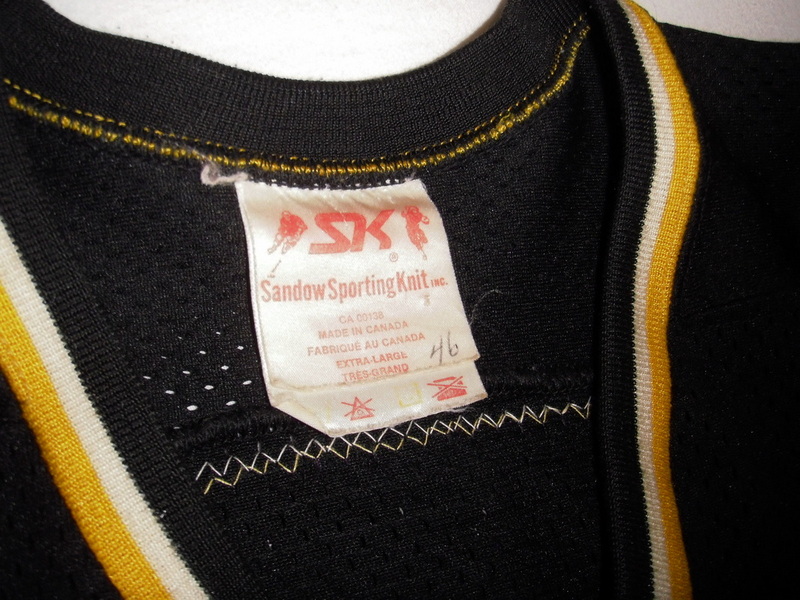 It seems that many of these jerseys left the team with the name on back removed. The original hand cut captain's C on the chest is just frosting on an already very attractive shirt. This jersey is a highlight of my collection and would have been the first one worn by Randy after he was named 1981 Norris Trophy winner as the league's best defenseman. 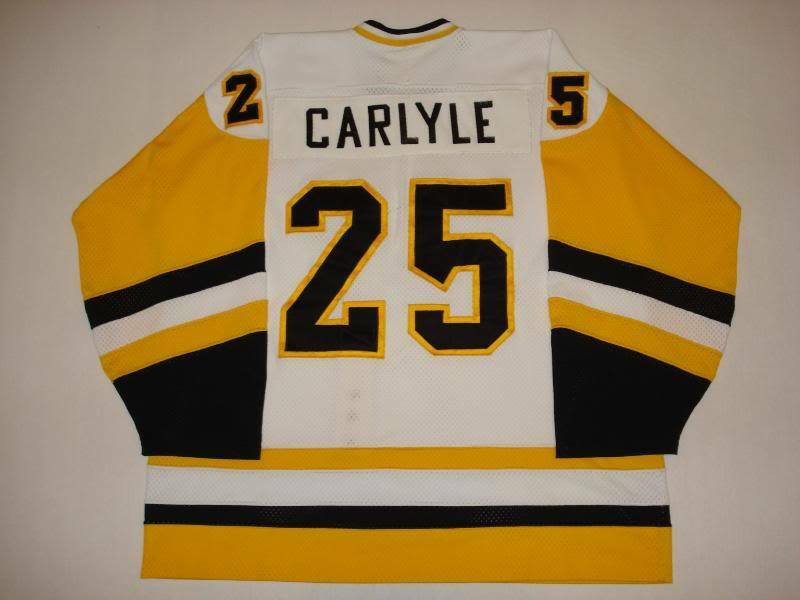 Carlyle at the time was the 6th player in franchise history to wear the captain's C.
I spotted this jersey on the back of a fan at a Pens game several years ago. I didn't approach the wearer or make an offer. I kicked myself ever since...until one day it appeared on ebay and I was able to work out and offline deal with the local seller. He claims it came from a nearby thrift store and that he paid only $6 for it !!! It just goes to show you that these treasures can be lurking anywhere, and to never give up on a jersey as they always seem to resurface. Shows some light wear, and has the custom trainer added fight strap reinforced through the back number. One of the first snap type fight straps ever used in a Penguins jersey. "It’s always special, this community. It’s nice to see they got a new building and the success the organization has enjoyed." "I remember my first training camp coming from the Toronto Maple Leafs. Coming here in 1978, the city has changed to some degree but in some other ways, it hasn’t changed." "The dressing room that’s in there, there’s an oil drip. That used to be my stall. I had to watch it. I couldn’t lean up against the back of the wall because my sweater would have oil on it." "Rick Kehoe, Russ Anderson, George Ferguson, Greg Malone. We had lots of characters. Brian 'Spinner' Spencer, Michel Dion. I got traded for Dave Burrows and he ended up coming back here a year and a half later so I played with him. Ron Stackhouse. " 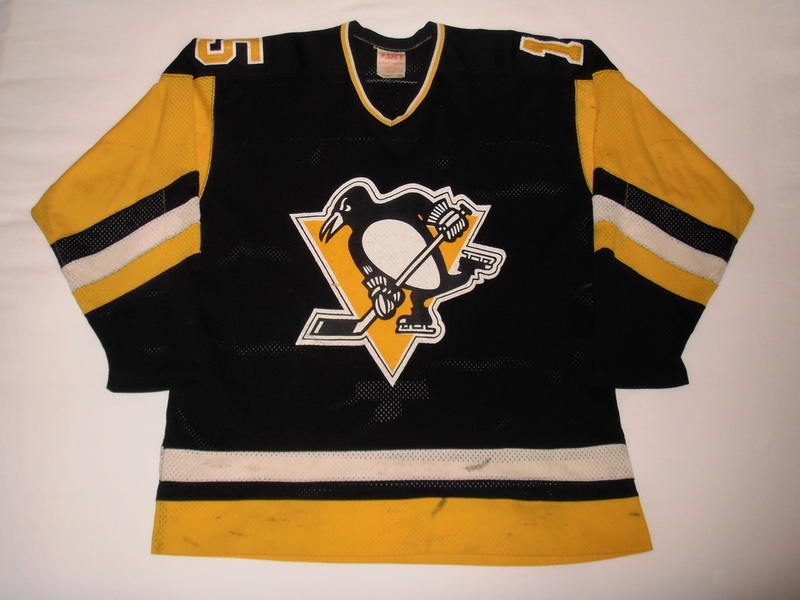 This General Athletic Randy Carlyle "Sunday Gold" is the best and most attractive Sunday gold Penguins jersey in the hobby in my humble opinion. Fully sewn hand cut twill numbering and crest, as well as trainer added fight strap. 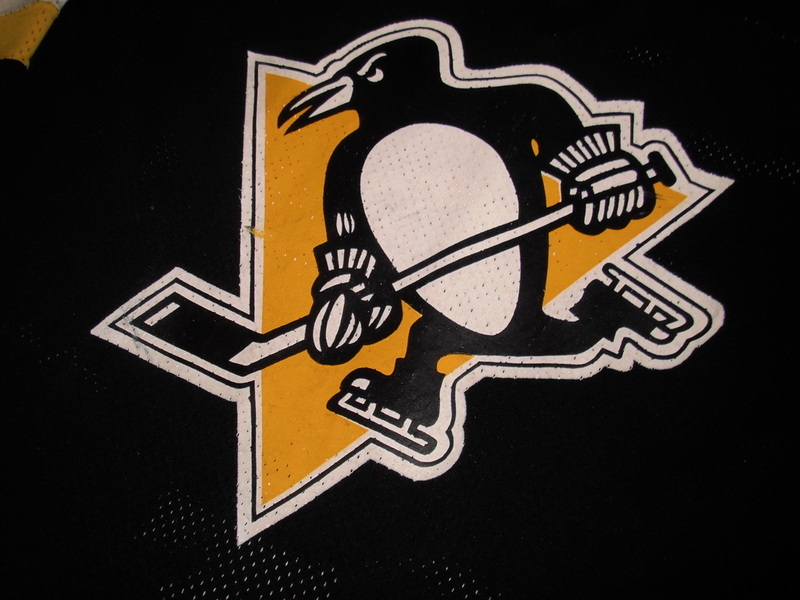 A simply incredible piece of Penguins history. Captain's C is frosting on the cake. What can I say about this one? Pure aesthetic beauty. All sewn on but the name. Condition is great as it was worn sparingly as an alternate. Easily one of the best looking and most memorable styles of any NHL team of this era. I absolutely love these all sewn General Athletic styles. 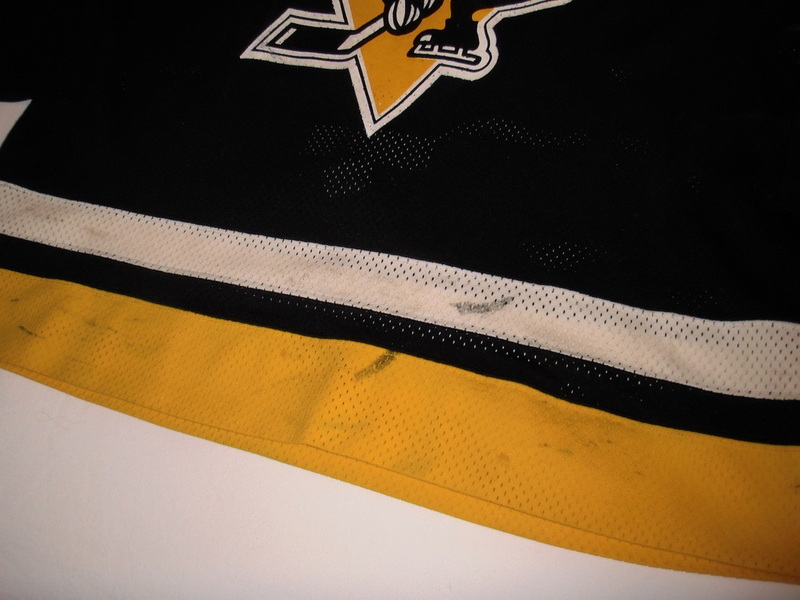 This was actually my first ever game worn jersey purchase, the one that started it all. 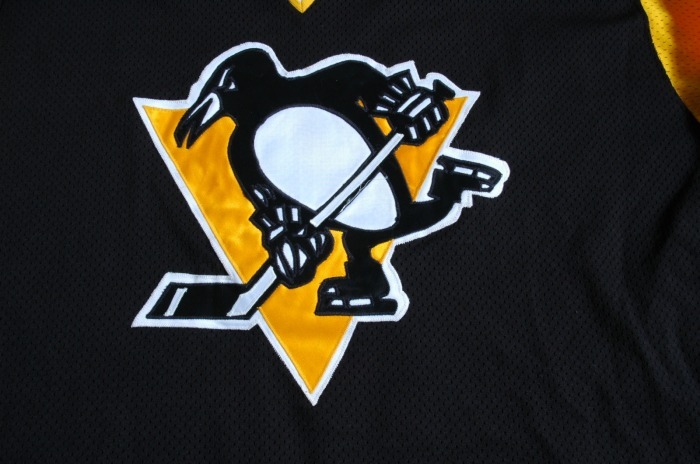 The jersey was obtained via ebay from a friend of former Pens coach Johnny Wilson. 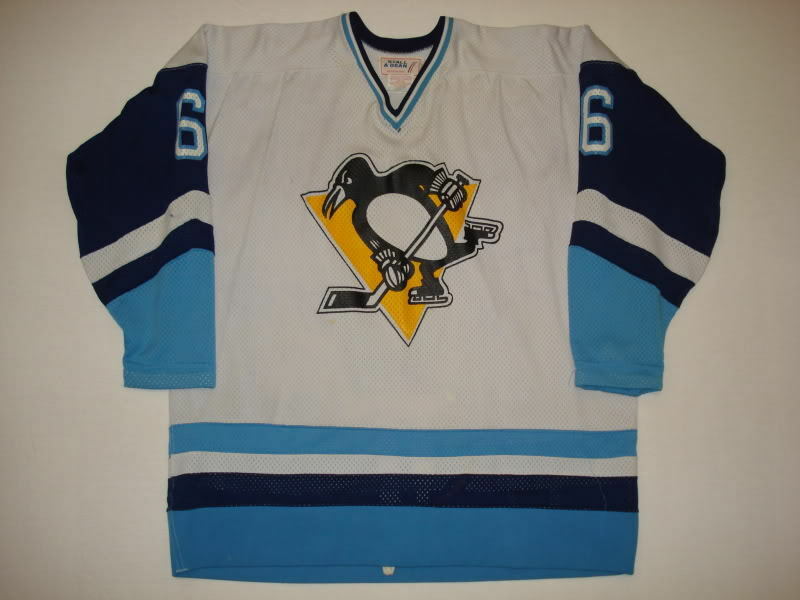 At the time it wasn't known for sure when or if the Pens ever even wore this style on the ice. With the help of Rich Ellis and Casey Samuelson I was able to determine that it is actually one of the rarest styles of Pens gamers in existence, having been worn by legendary tough guy Stan Jonathan, who was called up to Pittsburgh for a cup of coffee in early 1982. 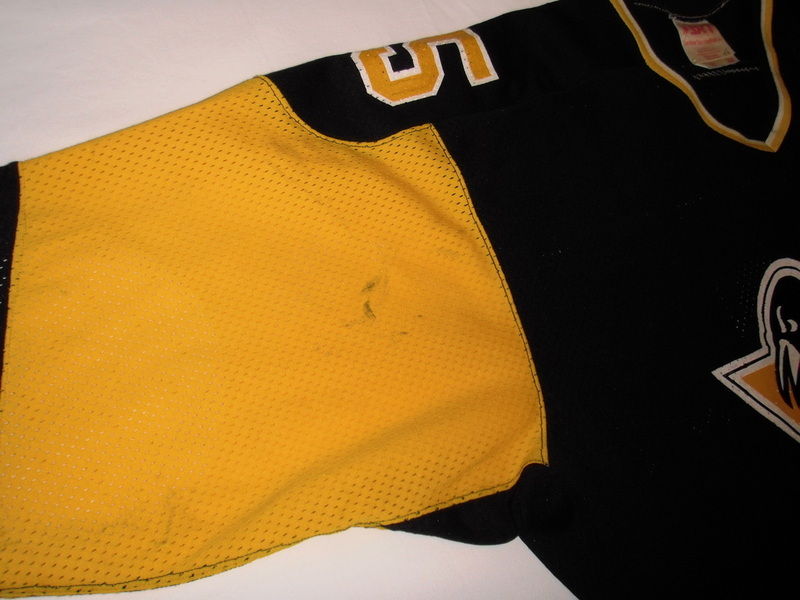 The jersey has a nice board burn on the cuff and is sized XL. Unfortunately the nameplate has been removed by the team, but some threads still remain in the mesh from it's hasty removal. 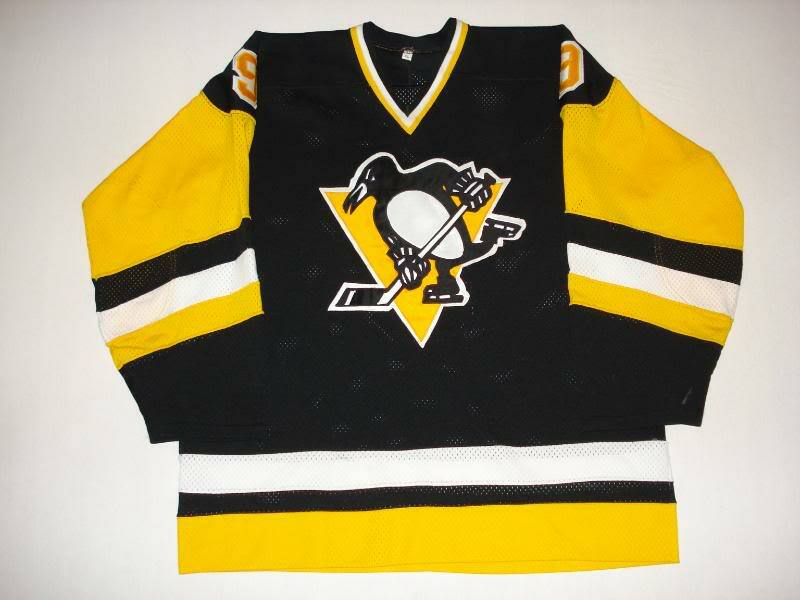 One of the best looking styles ever worn by the Penguins in my opinion, and one I won't likely ever sell. This jersey ironically doesn't have an added fight strap like the Carlyle and Ferguson of the same set. This is also the only XL General Athletic Pens jersey that I have seen. 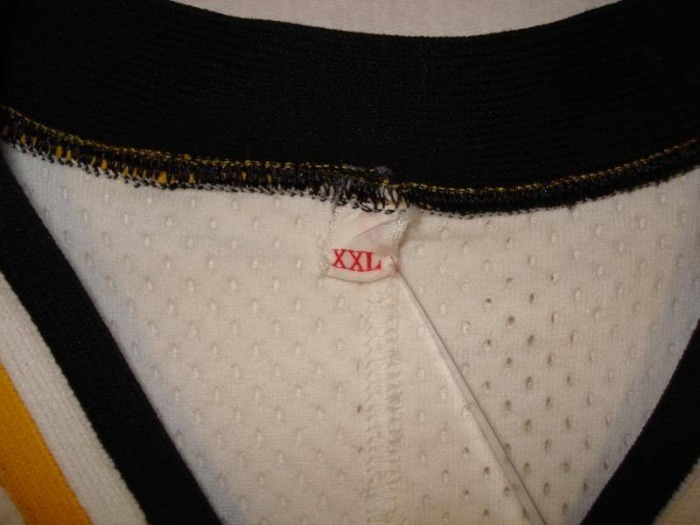 Most are size XXL. This leads me to believe the shirt was likely only ever intended for call up use and wasn't originally made for Jonathan alone. 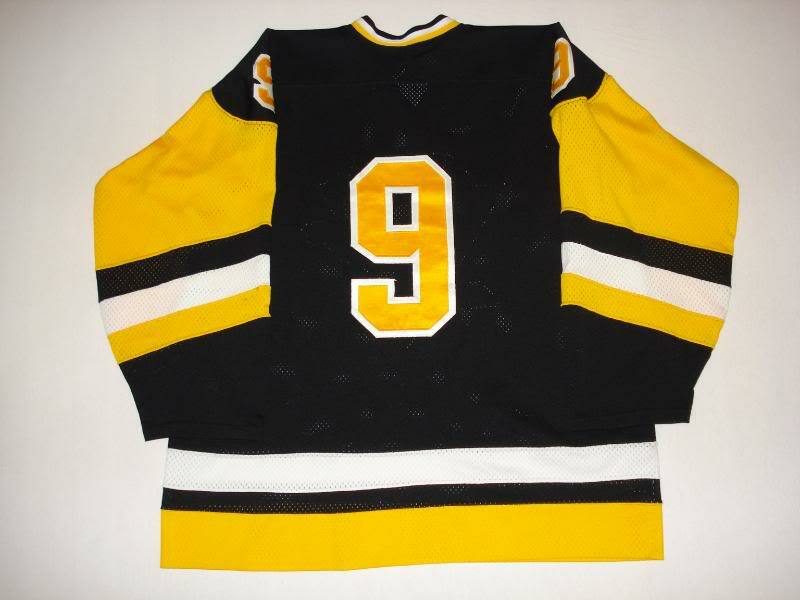 It is also my understanding that the numbering was added to these jerseys at General Athletic in Ohio, and not by the Penguins. 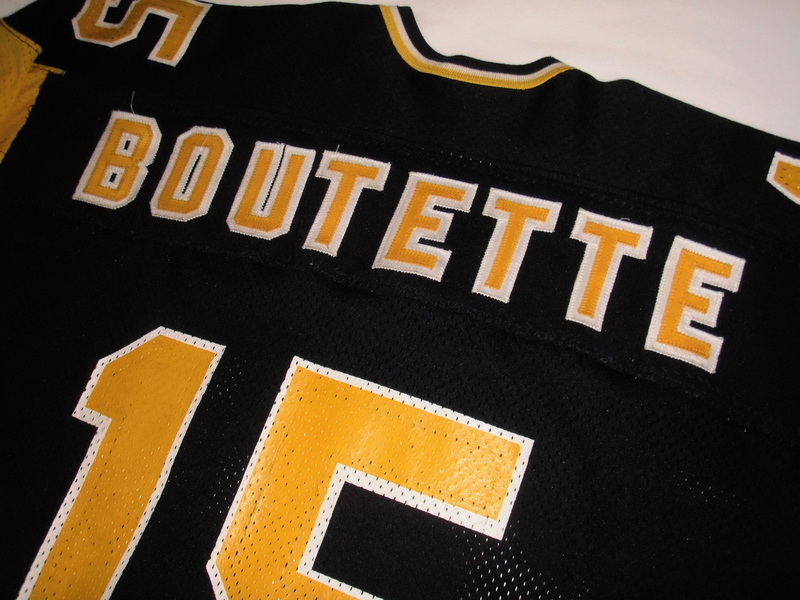 The Penguins were responsible for the addition of the nameplates only, hence their being a cheaper screened on design. 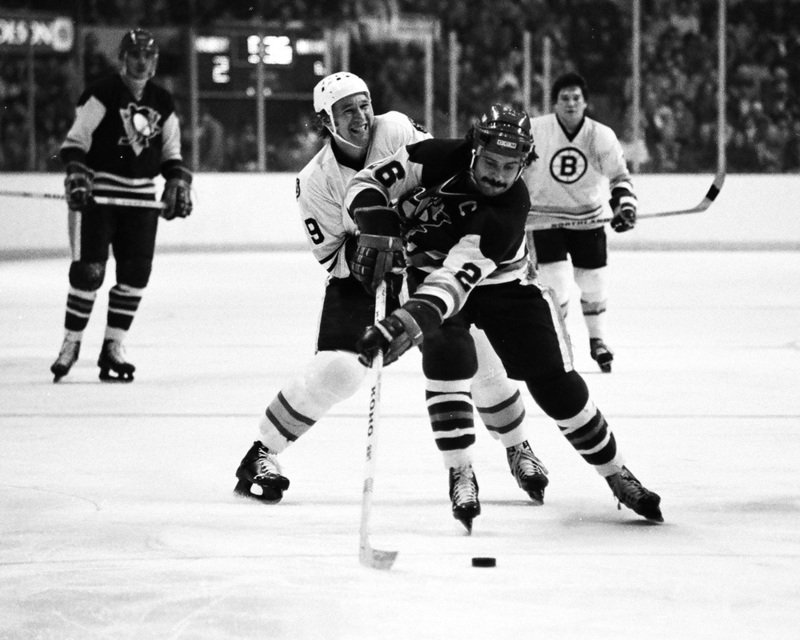 Stan Jonathan was a diminutive (5-8, 175-pound) wrecking ball, and favorite of coach Don Cherry and Bruins fans for six seasons, playing in Boston from 1976-82. Stan came to Pittsburgh on November 8, 1982, in a straight cash deal from the Boston Bruins. He played a split season in Pittsburgh also spending time with the team's farm club the Baltimore SkipJacks. Retiring after the 1983 season, Jonathan finished his NHL career with 91 goals and 110 assists in 411 games. He is remembered as a fearless checker and ferocious fighter, often taking on opponents much larger in stature, and winning. He is also a full-blooded Mohawk Native Canadian. His most legendary bout was against Montreal's Pierre Bouchard on May 21, 1978.